Awaken your senses and tickle your taste buds on this culinary journey through San Francisco's famous Ferry Building! Sample San Francisco's bounty of local, seasonally grown food products including meats, cheeses, breads and chocolates, on this two-hour tour that will delight foodies of all ages. The shops of the Ferry Building and adjoining thrice-weekly Ferry Plaza Farmers Market are revered by locals for their seasonal, sustainable produce and a tempting array of sweet treats. Join your epicurean concierge to discover the quality and cultural diversity of San Francisco's artisanal food community! You will meet your personal epicurean concierge in front of the Ferry Building Marketplace, which houses some of the most well-known food purveyors in San Francisco. The Ferry Building and Ferry Plaza Farmers Market are staples for the city's most talked-about chefs, and you will be guided through the market place to experience San Francisco as a local! You'll taste organic cheeses from Cowgirl Creamery and sample sourdough bread from ACME Bread Company. Try fresh-baked fruit and vegetable tartlets from Frog Hollow Farm in nearby Brentwood, munch on the French macaroons from Miette Patisserie; and taste chocolates from Recchiuti Confections. 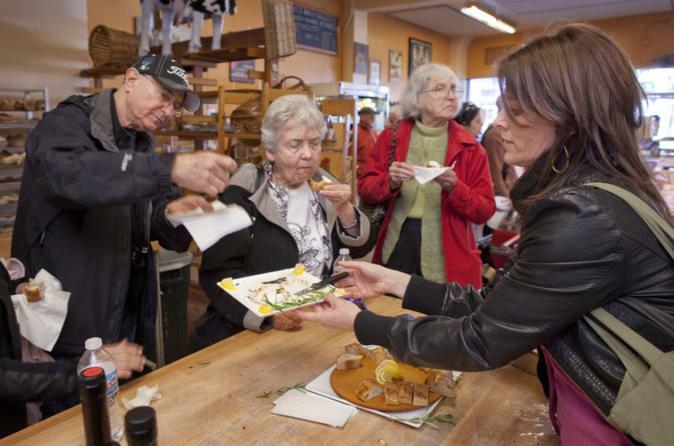 All tastings are included on this great-value tour, so be sure to work up an appetite! It's a mouthwatering excursion to culinary Utopia!